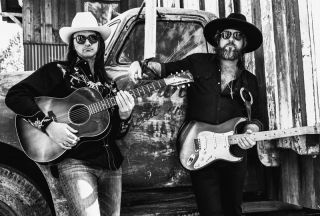 BackStory Events and Guitar World invite you to join us for the live stream of our exclusive interview with the Allman Betts Band. The interview will take place at 8:30 p.m. EST this Tuesday, March 26, live from The Cutting Room in New York City. We’ll talk to Devon, Duane and the band about touring the world, the upcoming release of their debut album, and the musical legacy of The Allman Brothers Band, this year celebrating its 50th anniversary. The event includes live interviews, audience Q&A, and a special short performance. Devon and Duane will be interviewed by New York Times best-selling author and journalist, Alan Paul. The event is part of the BackStory Events online series and will be live streamed by Guitar World magazine. To find out more, visit allmanbettsband.com or backstoryevents.com.